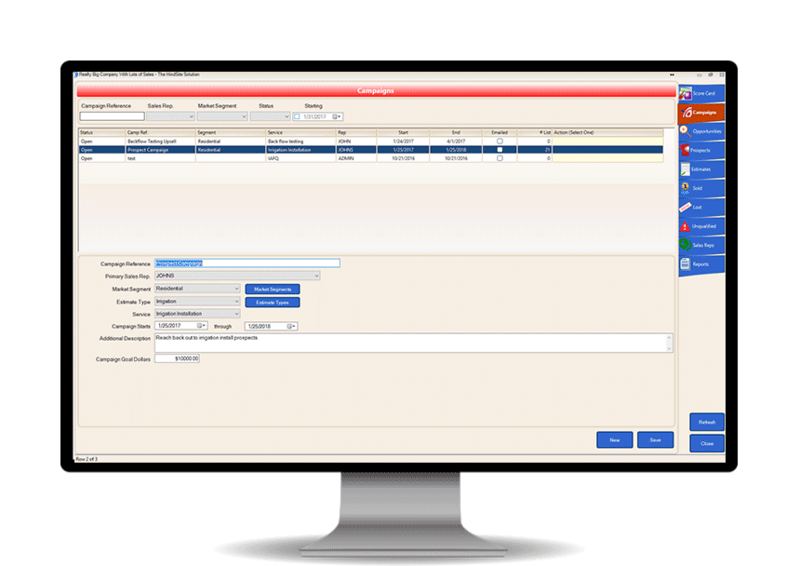 HindSite's Sales Manager makes it easy for you to manage your sales process - and grow your business. HindSite's Sales Manager helps you organize your sales process so you can identify prospects that are most likely to turn into new revenue. With HindSite's Sales Manager, you'll be able to analyze and improve your sales process with ease. The Sales Manager's campaign management tools help you quickly and easily target and market to prospects and customers. HindSite's Sales Manager delivers visibility into the status of your prospects, making it easy to develop comprehensive marketing, sales and operations plans. Have a bunch of open estimates you expect to sell soon? Prepare your operations team for a busy future. Don't have many opportunities at the top of the funnel? Create a campaign to build your sales pipeline. See every opportunity in your pipeline so you can forecast more effectively. By being able to see your pipeline and forecast future sales, you'll be able to more effectively plan your work. Because you see how many opportunities you have at the top, middle and bottom of the funnel, you can eliminate sales droughts by actively marketing when your funnel empties. Leverage the Sales Manager's campaign management tools to drive sales growth in your field service business. Campaigns help you target specific customers and prospects, track activity and measure the effectiveness and ROI of specific sales and marketing campaigns. Plus, if you use HindSite's email add-on, HindSite Connect, you can send mass emails to your campaign lists with a few mouse clicks. Want to sell a new service or product to customers? The Sales Manager leverages your HindSite customer database to target and personalize your campaign. Campaign tracking makes it easy for you to see which sales and marketing efforts result in the most revenue. If you use our email add-on, HindSite Connect Pro, you'll be able to instantly send personalized, branded emails to members of your campaigns. One of the keys to successful selling is having a complete log of all your activity so you can personalize your pitch and ensure nothing falls through the cracks. The Sales Manager stores all of your call notes, email notes and tasks so you always know what happened on every opportunity. With HindSite's Sales Manager, you'll have a complete history of your calls with each sales opportunity, simplifying follow-up. Thanks to the Sales Manager's reminders, you'll never forget to call a hot opportunity again. With more information readily available, you'll be able to personalize each call, email or visit and deliver a better impression. Being productive is the key to being a successful sales representative. 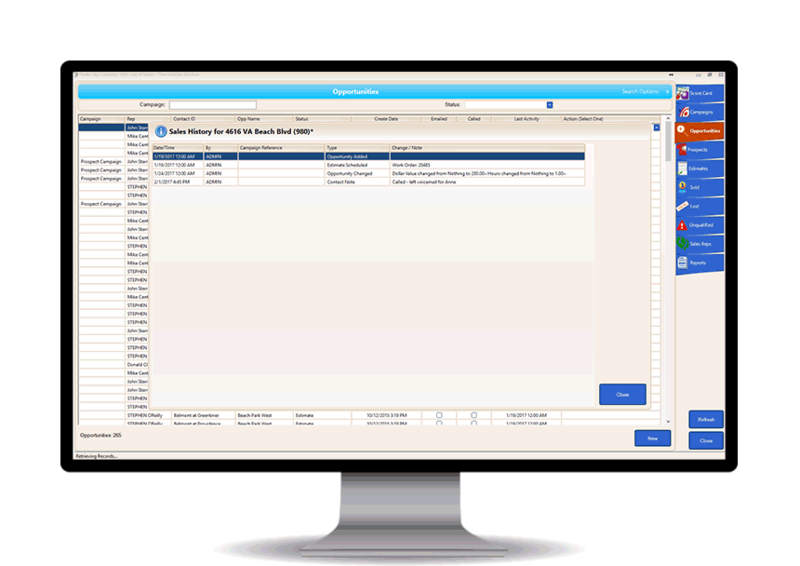 HindSite integrates the data you collect about your sales opportunities into your sales workflow. That means you can quickly create an estimate and attach it to a sales opportunity or schedule an on-site estimate with your sales rep. 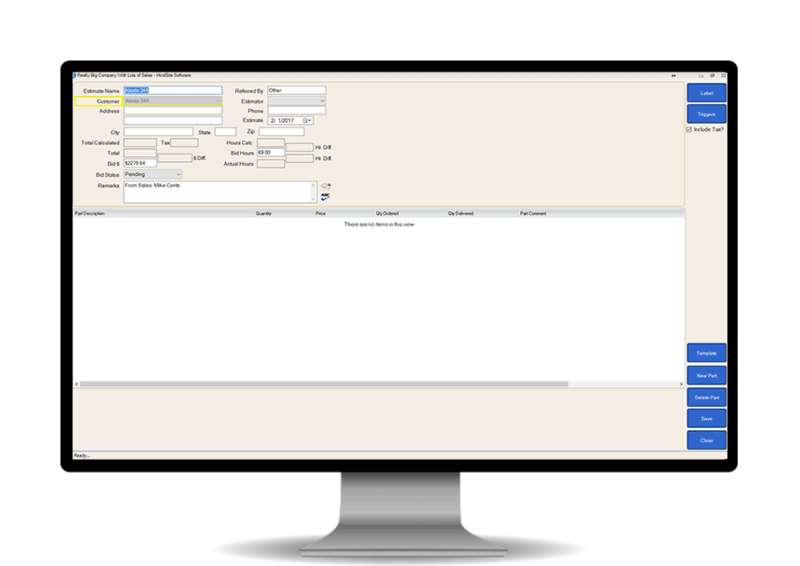 Creating estimates is integrated into the Sales Manager, making it easy to create and track estimates. In addition to estimates, HindSite's integrated scheduling functions simplify adding sales visits to your calendar. Because the Sales Manager can be tightly integrated into your workflow, you'll save time. Time you can spend with opportunities generating new revenue. The key to selling smarter is understanding how your sales reps are performing. You can't improve what you don't measure. 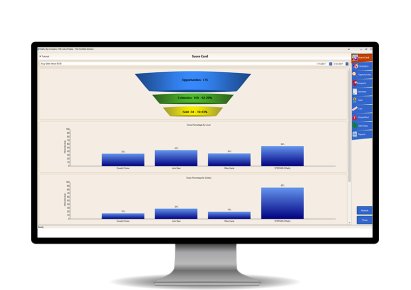 The Sales Manager's dashboard delivers at-a-glance sales analytics, while reports provide opportunity, sales rep and campaign details that make it easy to understand how your sales team is performing. The key to improving your sales process is knowing your metrics. You close rate tells you what percentage of opportunities each sales rep closes. Improving that metric can significantly impact your business. Successful sales and marketing is simple: Measure everything and then do more of what works. The Sales Manager helps you setup, manage and measure your campaigns so you can sell more. The Sales Manager helps you visualize your sales pipeline, so you can see at a glance how your sales team is doing. Being an effective manager starts with measuring your employee performance. HindSite's Sales Manager delivers the data you need to assess how your sales reps are performing. Armed with data, you can discipline, encourage and reward your sales reps for their work. The Sales Manager's reports make it easy for you to measure your sales rep performance on key metrics like close rates and revenue produced. See all of your rep's activity, so you know who's putting in the effort to generate new sales. Leverage the data in the Sales Manager to train and improve your sales reps. Have a low-performing rep? Put togehter a plan for your best rep to mentor him or her.